As I own beautiful Samsung Galaxy Nexus, I'm sometimes willing to make some screenshot to blog, show a friend or send bug report to developers etc. 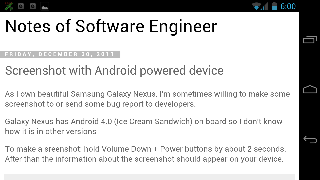 Galaxy Nexus has Android 4.0 (Ice Cream Sandwich) on board so I don't know how it is in older versions. To make a sreenshot: hold Volume Down + Power buttons by about 2 seconds. After than the information about the screenshot should appear on your device. Below is the screenshot of this post.